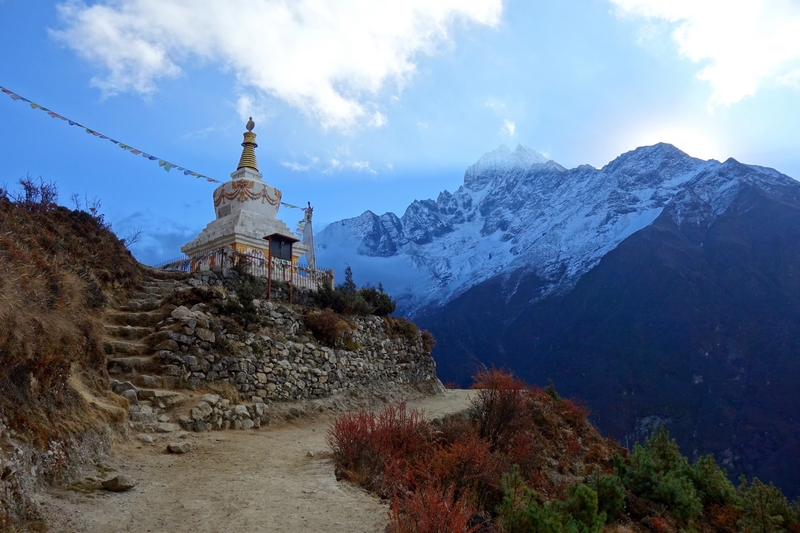 I really loved my experience hiking through Nepal’s far east Kanchenjunga region with a group and guide(s). But after spending many weeks around people all the time, I was feeling ready for another solo adventure. More importantly, I was thirsting for a challenge that would involve trail running. I’d always said I had no interest in the Everest region, writing it off as “too touristy” (when did I become such a snobby hipster?). 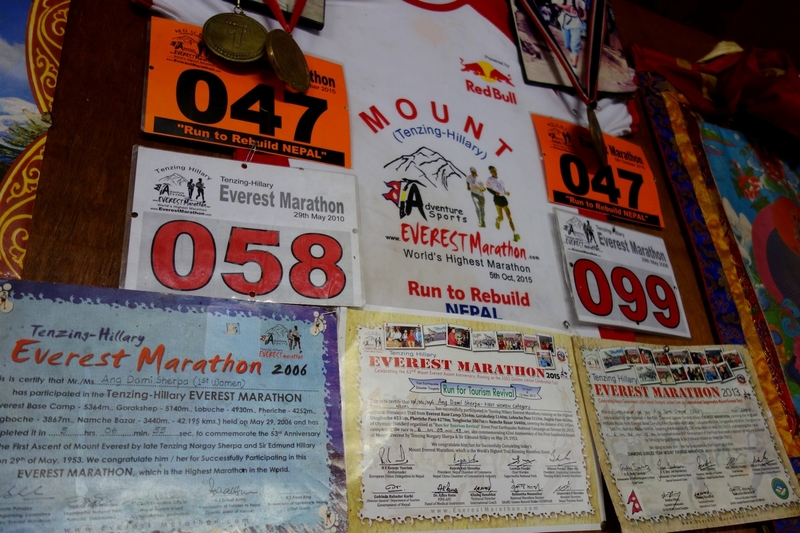 But for a trail running/fast packing adventure, the Everest region was the perfect choice, offering numerous hotels with a plethora of services and comforts which would make minimal packing possible. 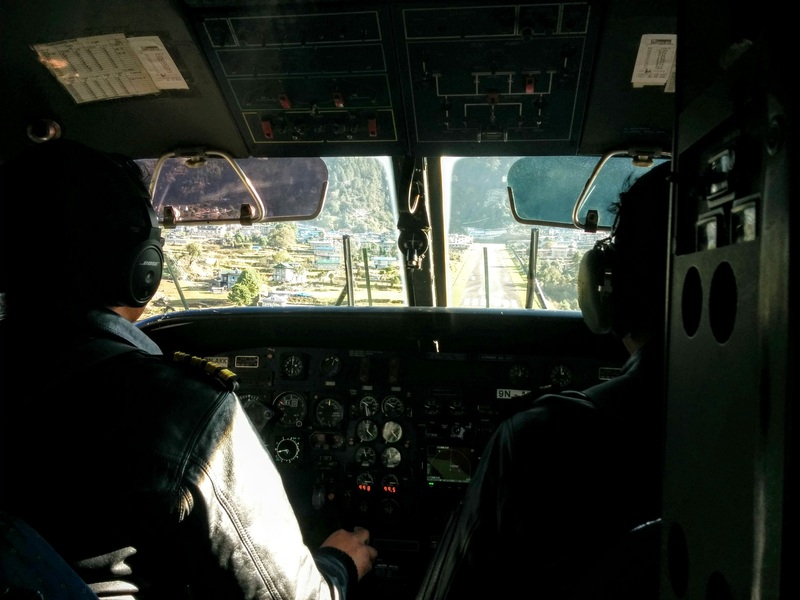 Flying into Lukla (elevation 2800m) is an exciting and terrifying experience. You take a miniature plane on a mountain flight ending on a rather short looking runway that stops abruptly at a massive rock wall. You really have to trust that your pilot knows what they’re doing. 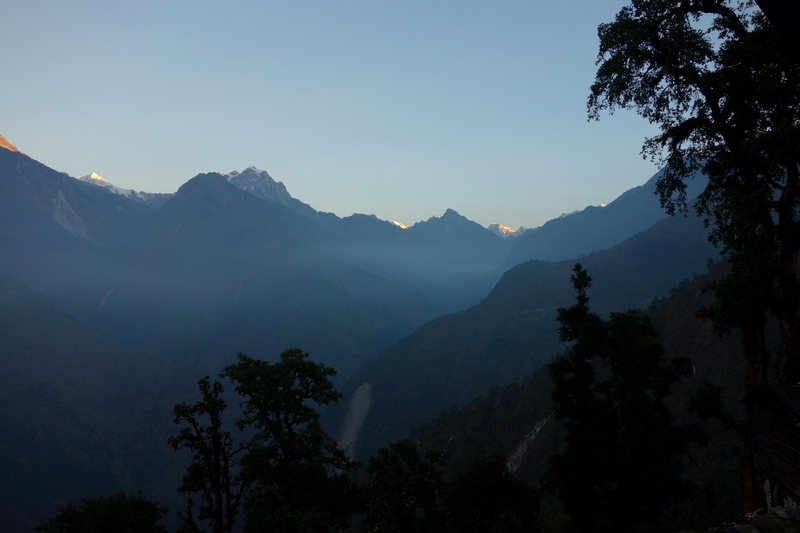 Upon my safe arrival in Lukla early in the morning, I wasted no time and set off on the trail right away. 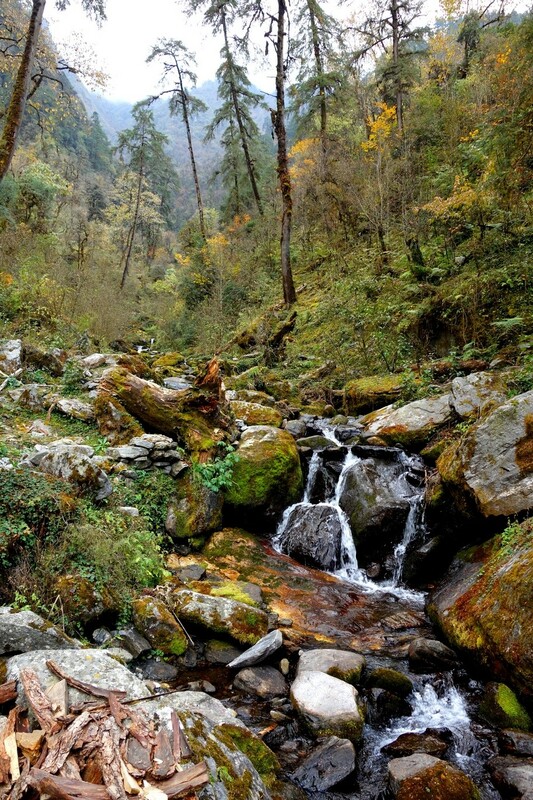 The first part of the hike follows a gorgeous river valley, climbing slowly through many small villages offering trekking shops. 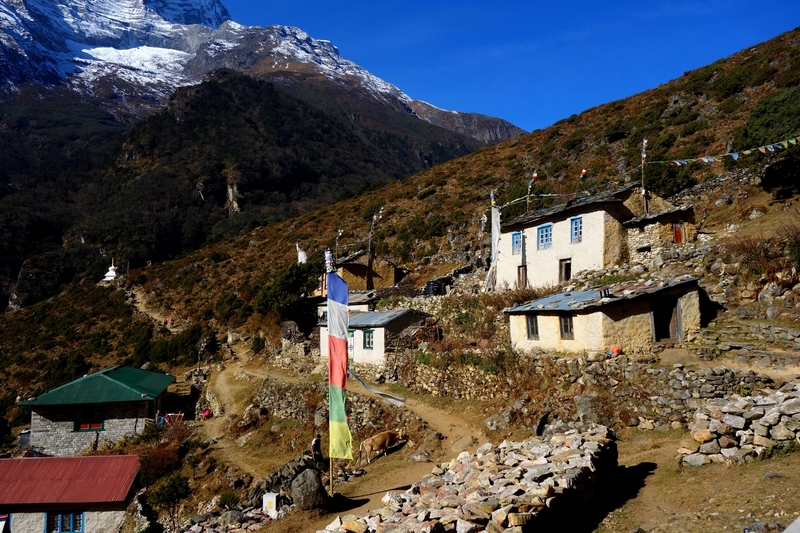 Most hikers stop in some of these villages for a few nights, beginning the acclimatization process. 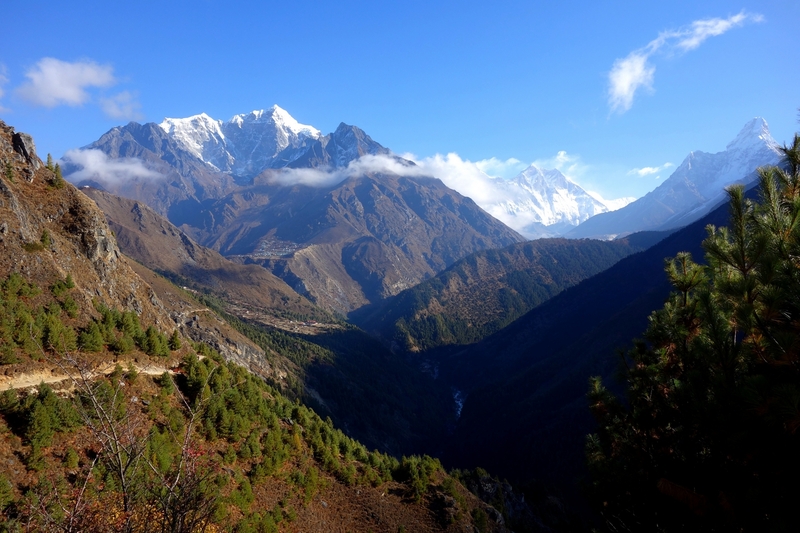 However, I was already fairly well acclimatized given my previous three months of trekking in Nepal, so I was able to fly along the trails making minimal stops. 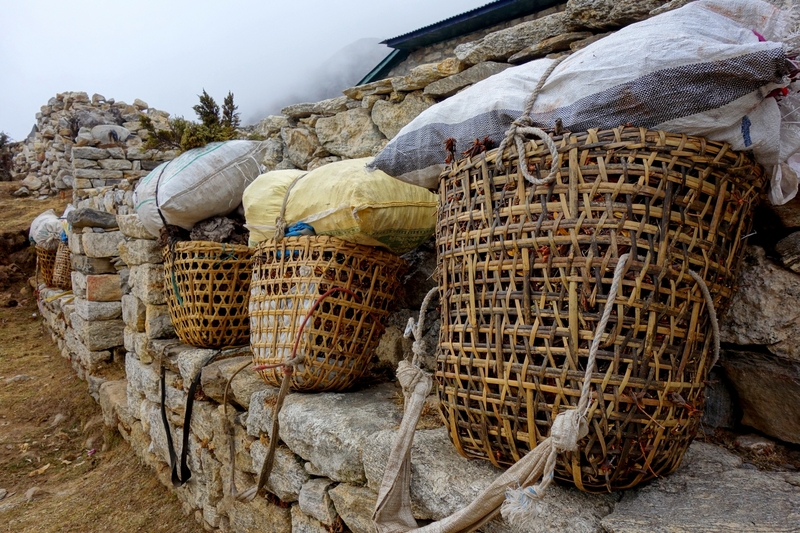 Eventually I came to a ~700m fairly steep climb up to the famous Namche Bazaar. I powered up it, getting my heart beating and my sweat on – just the way I like it! After 5.5 hours of moving at a relatively speedy pace, I checked into the Yak Hotel at the early hour of 2:30pm. I’d ran 25km the previous day in Kathmandu, so I felt I could allow myself the “short” day. 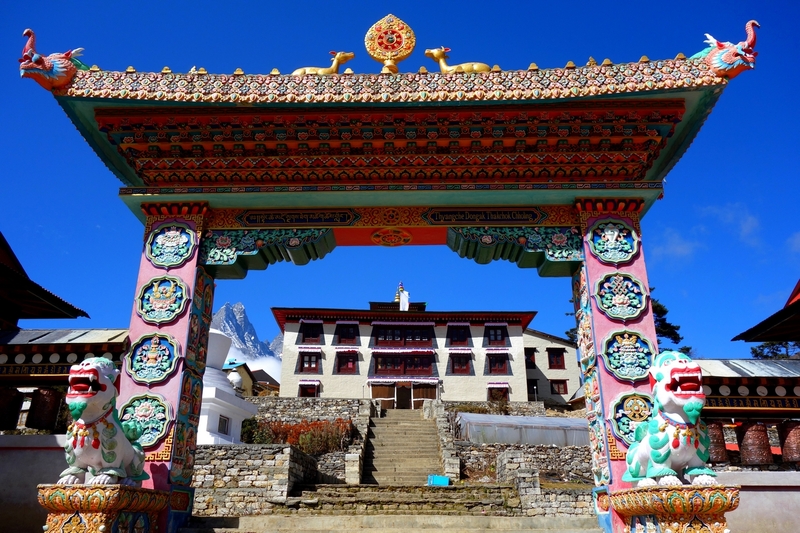 Plus, Namche, at 3440m is an enjoyable, picturesque place to hang out, occupying the inner round of a large u-shaped hill. After a comfortable sleep, a muesli breakfast and some high-fives with the other hotel guests, I took off up-valley. I kept myself at a swift walking pace, occasionally running. The trail traversed and slowly climbed a large hill, offering expansive views of the valley and snow-capped peaks in the distance. With the crisp morning air and light, I felt like I was running through the sky. 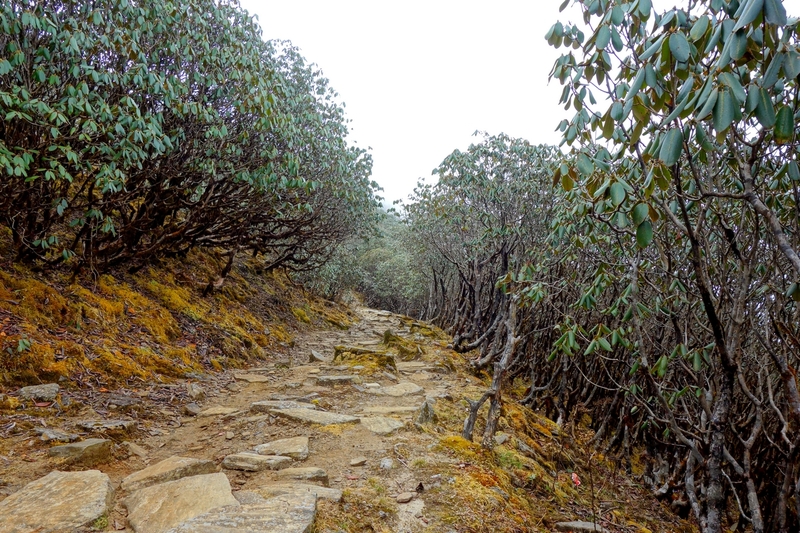 Soon the trail began to climb more steeply, this time through rhododendron forests and up to Tengboche Monastery. This has to be one of the most peaceful and beautiful places on the planet. I didn’t linger too long, though, eager to keep the pace up as I rose above the treeline altitude and into colder temperatures. 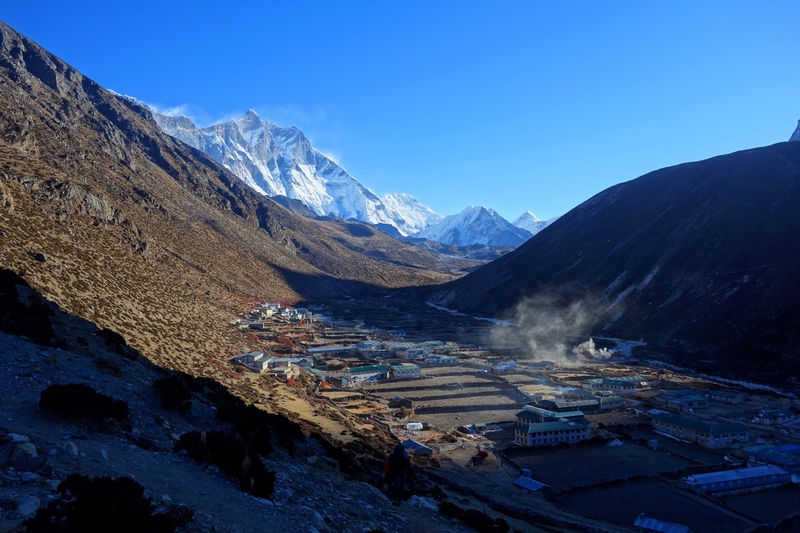 After 7 hours (including a lunch stop) I arrived in Dingboche at 2:30pm, elevation of 4410m. Deep in the mountains now, I was shocked to find a commercial size oven in a proper bakery. Naturally I HAD to take advantage of the luxury and indulge in some apple pie. How those people got a giant oven all the way into Dingboche, I can only guess. 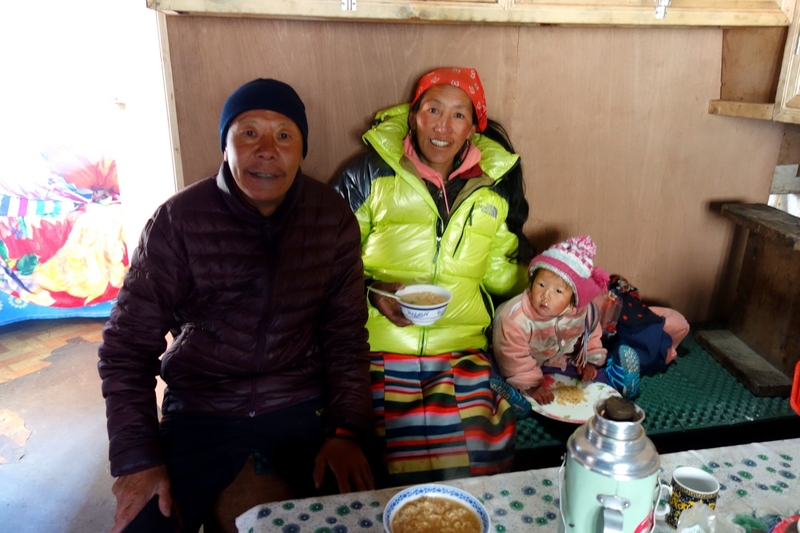 Here, I felt extremely thankful to the well stocked hotels as the temperature was going well below zero at night, and I was relying on provided blankets to survive the cold evenings. For my fastpack I was not carrying a sleeping bag. 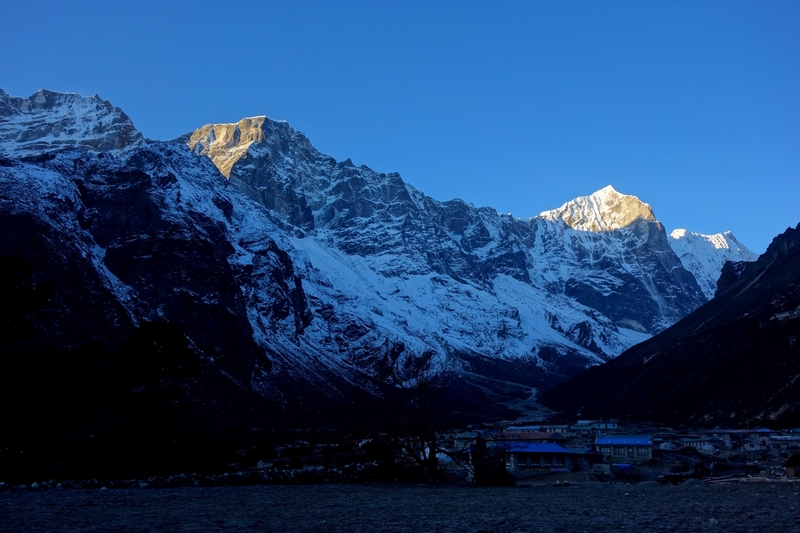 I shared the hotel in Dingboche with a group of climbers that were gunning for Ama Dablam, which made me extremely jealous and further encouraged some budding ideas I’ve had about getting more involved in alpine climbing and ski mountaineering. The next morning I felt rested and ready to charge forward like the racer in me. First I crossed a large sweeping valley on a hilltop, now high enough to be free of any trees. 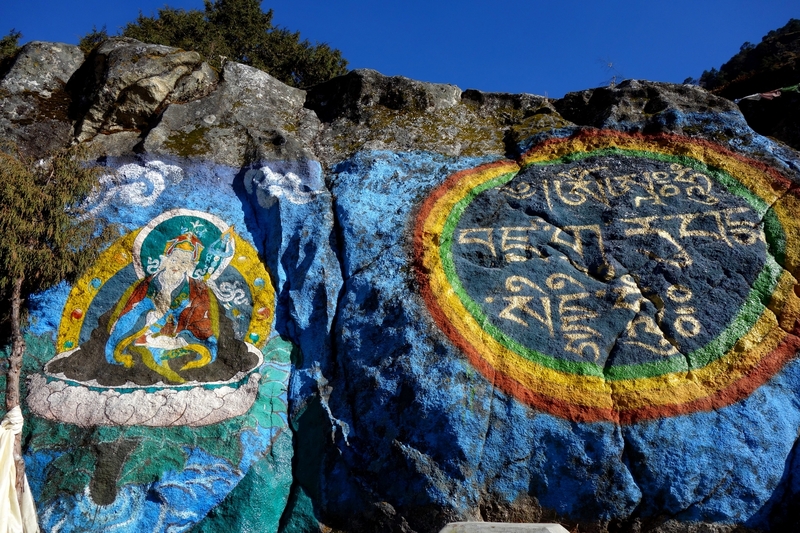 I climbed up the fairly steep Thokla Pass and upon reaching the top of it, I met with quite the shock. 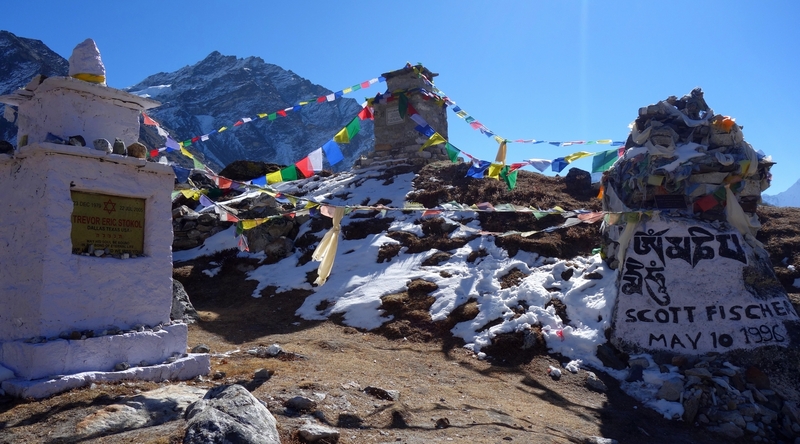 All around me I was suddenly surrounded by not only a view of some of the highest mountains in the world, but also by memorials and tombstones erected for deceased climbers and trekkers lost to Mount Everest and the Solu-Khumbu valley. For whatever reason I totally lost it then and burst into tears. I never knew any of the people, but their deaths touched home for me. I was simply overcome with emotion in a moment encircled by the beautiful but deadly mountains which had claimed those lives. I cried bittersweet tears for the magnificence and promise which drew me, thousands of other travellers, and the departed to this place. I gathered my composure and continued my push onward. 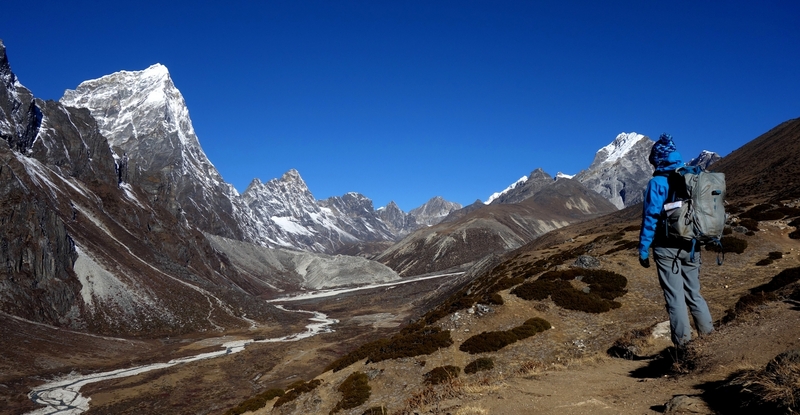 The trail became rockier as I entered the Khumbu glacier moraine, and at around noon I arrived in Gorakshep. I stopped there for lunch, but since I’d arrived so early I decided I had plenty of time to push on. 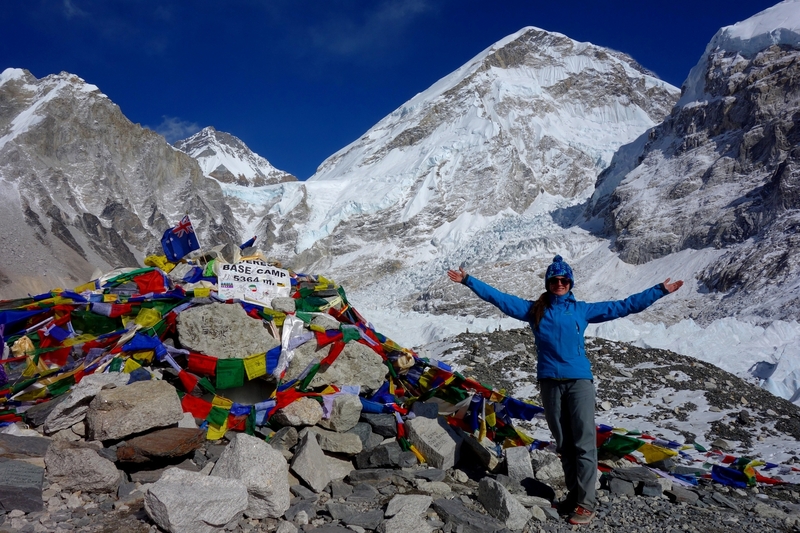 So I ended up making it all the way from Lukla to Everest Base Camp in only 3 days. Base Camp itself was a little anticlimactic, since there were no climbers or tents set up, and the view of Everest itself is largely obscured by other mountain features in front of it. 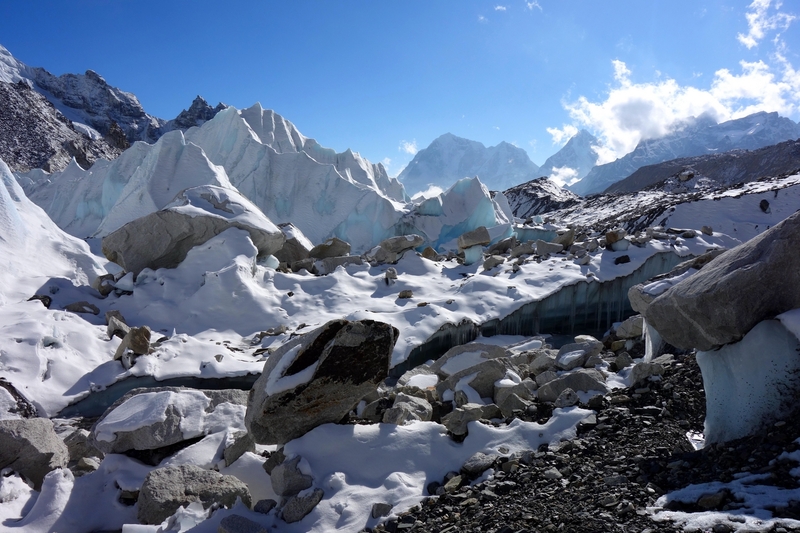 So I took some obligatory EBC photos and moved on to explore something much more interesting to me: the Khumbu glacier itself! I stuck some micro-spikes on my shoes and dropped down onto the glacier to explore its blue ice. 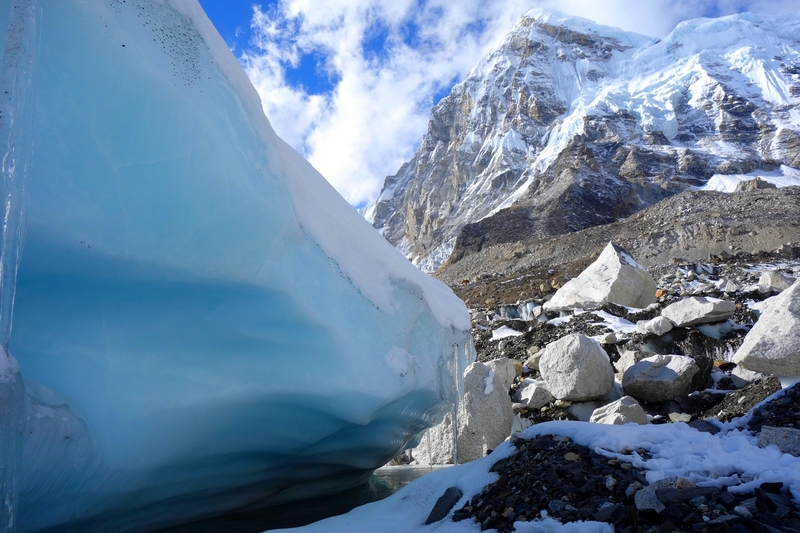 Here’s a short video of my view at Everest Base Camp. 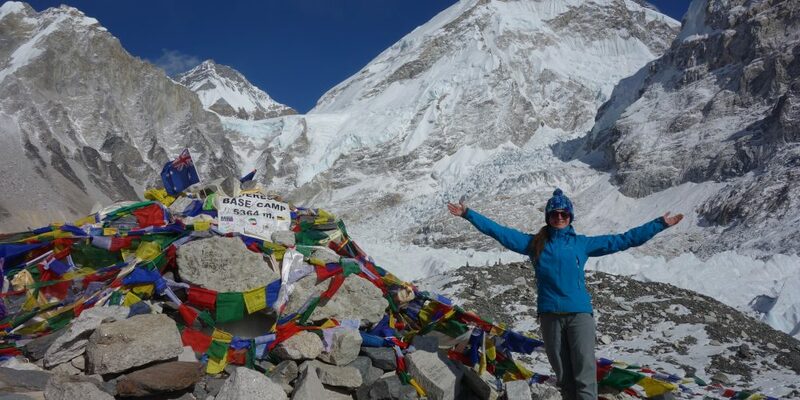 I’m at Everest Base Camp! That night was a very chilly one in Gorakshep, and I don’t think I slept a wink. In part, I can blame the raging headache I’d developed overnight. A headache can be from almost anything, but at high elevation it usually indicates the onset of some altitude sickness. I think this was the case with my headache, exacerbated by the fact I hadn’t been drinking enough water, since my water bottle kept freezing. I’d been planning to go up Kala Pattar that morning to get a good view of Everest at sunrise, but the headache bid a necessary descent, rather than a further ascent. 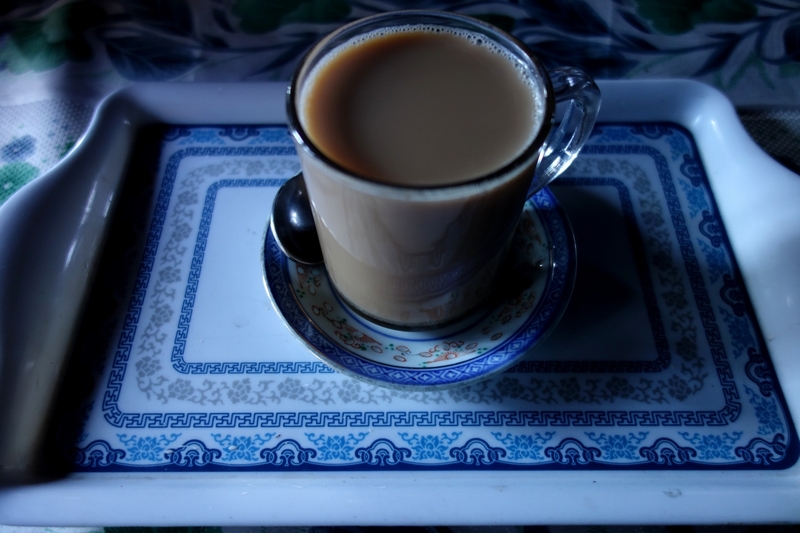 So down I went, taking many stops at teahouses to rehydrate. I’d also been planning to head up the Cho La pass toward Gokyo, but a few hours later when I reached the turnoff to travel this direction my headache still hadn’t improved, so further down I needed to go, instead. Retracing my steps from the previous day’s, I descended all the way down to 4000m, fighting my body the whole way, before finally stopping once my headache seemed to be improving. I grabbed another meal and laid down for a much needed nap, barely having slept the night before. The next morning the headache was gone and I felt amazing from all the rest. 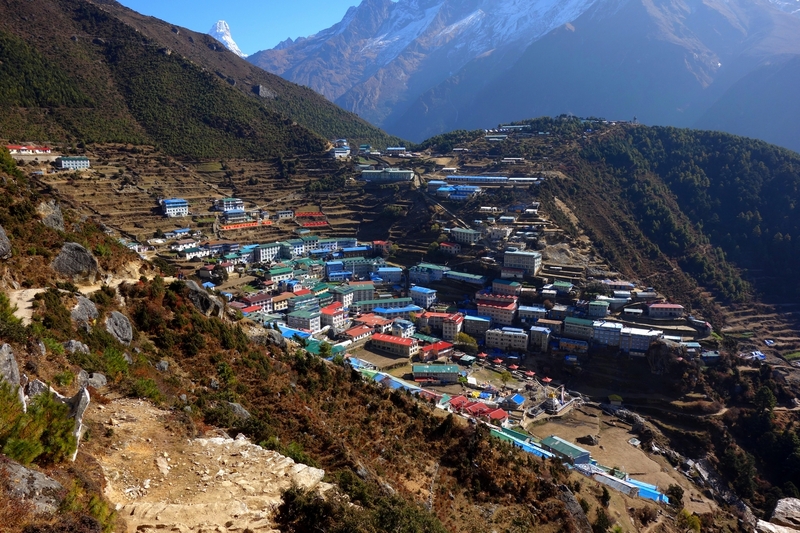 I ended up running the whole way back to Namche, speeding down technical downhills, leaping over streams, and bounding up hills. Coming back into more oxygen always feels great when your body has been deprived for a few days. 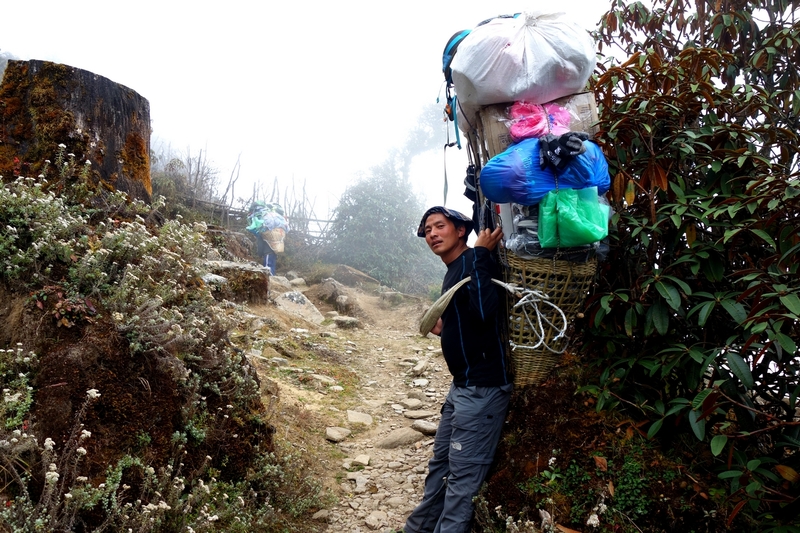 Porters, guides and trekkers laughed and cheered as I swooshed by them on the trail. 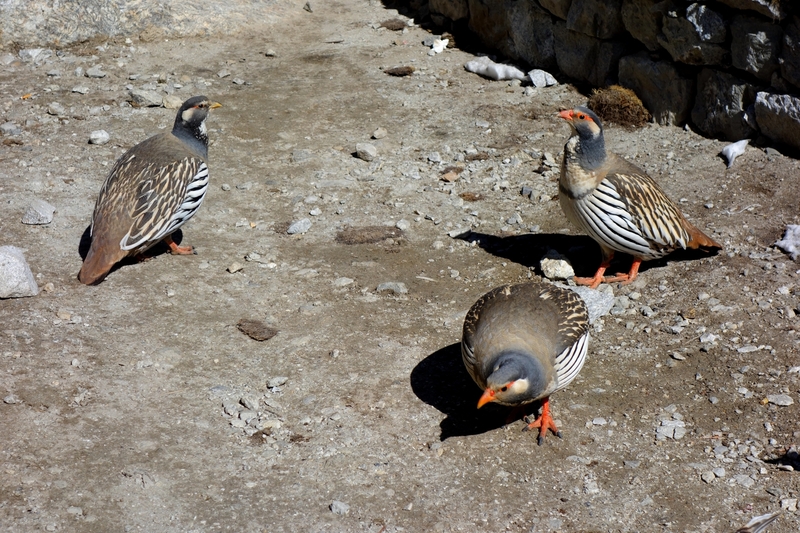 Upon arrival in Namche I returned to the Yak Hotel and decided I deserved a rest day the next day. 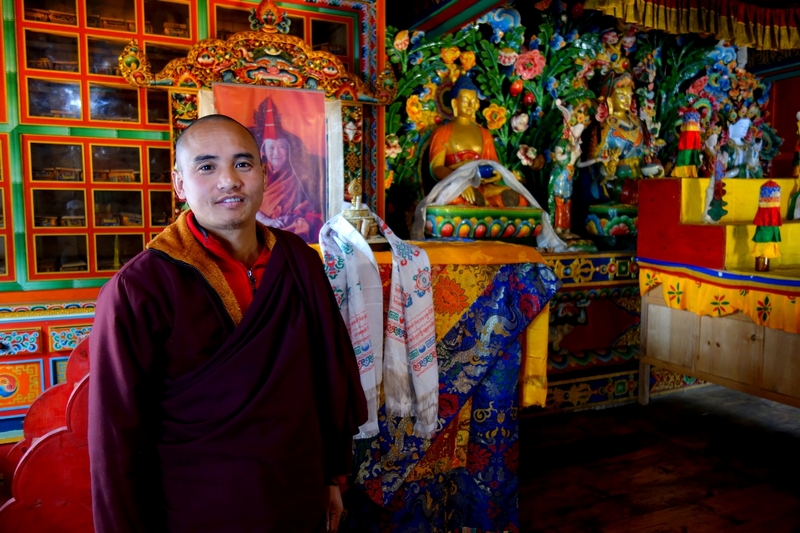 I spent my time in Namche reading, writing, drinking cappuccinos and attending movie and documentary showings. 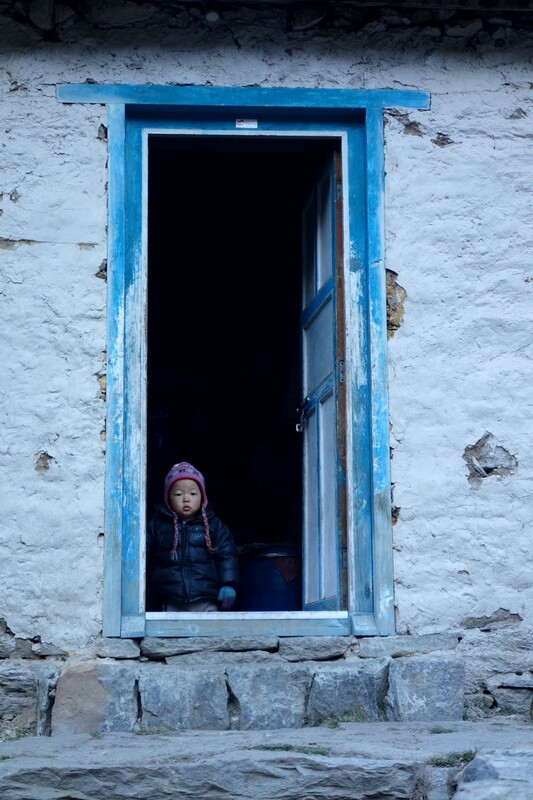 I wanted to observe more of the vibrant Sherpa culture of this gorgeous region, so from Namche I decided to head up to Thame, along a traditional trade route to Tibet. 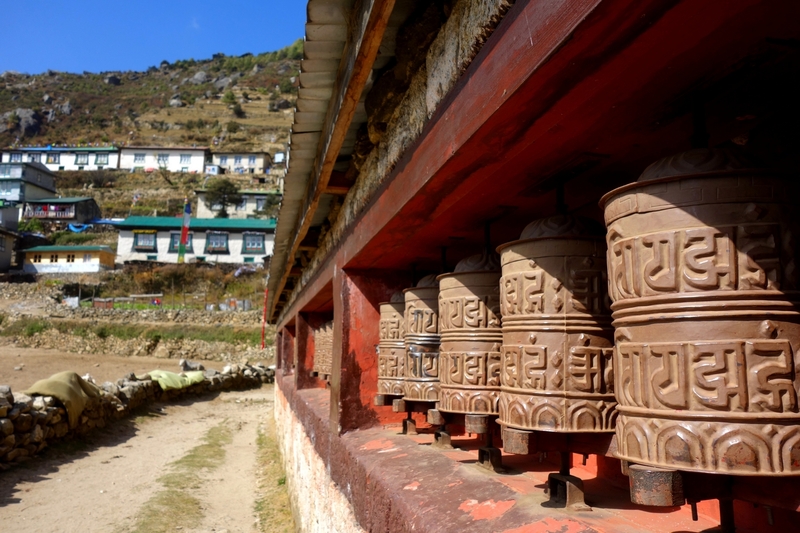 Knowing these would be some of my last days in the high Himals, I took my time, slowly walking through the valley and enjoying all the little Sherpa villages and their religious erections along the way. 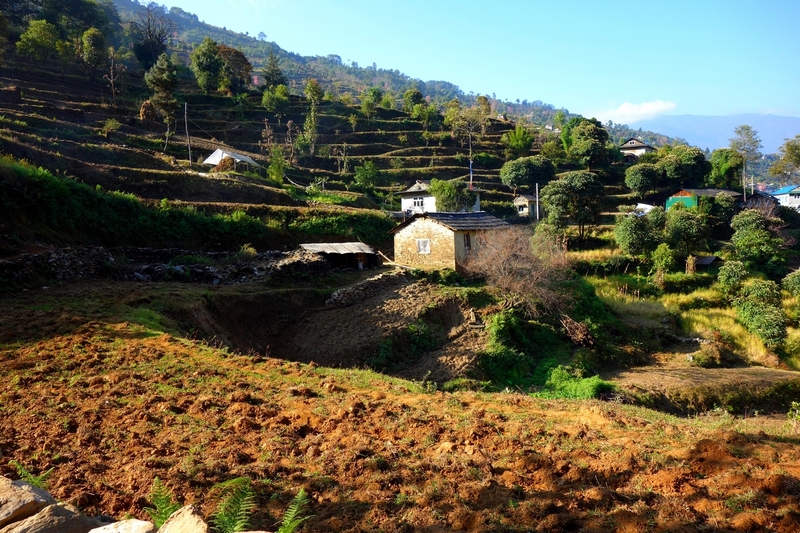 My thoughts were filled with appreciation for all Nepal’s eccentricities and details, from the juniper bushes to the way Nepali’s construct their homes. Soon I crossed paths with another solo-trekking Canadian, Sean, and together we finished the walk up to Thame. It was kind of nice talking about home for a little while on a day when I was already feeling reflective. In Thame, and upon a recommendation from Doc McKerr, I chose to stay in a small, unassuming lodge called the Marathon Runner Hotel. This turned out to be a rewarding experience, as the family was incredibly welcoming and friendly. 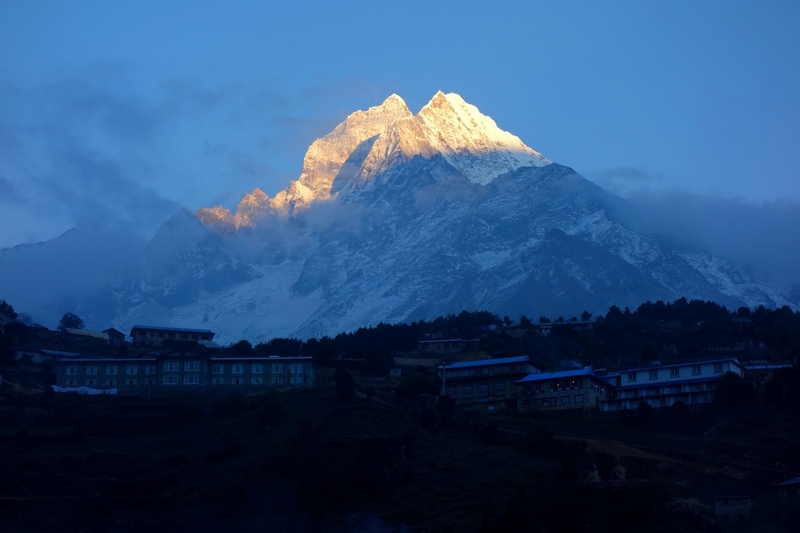 The hotel is named for the lady of the house, Ang Dami Sherpa, who has won the women’s category for the Tenzing-Hillary Everest Marathon three times. Runners are my people, across any language barrier, and upon my departure the family presented me with a white silk Khata. 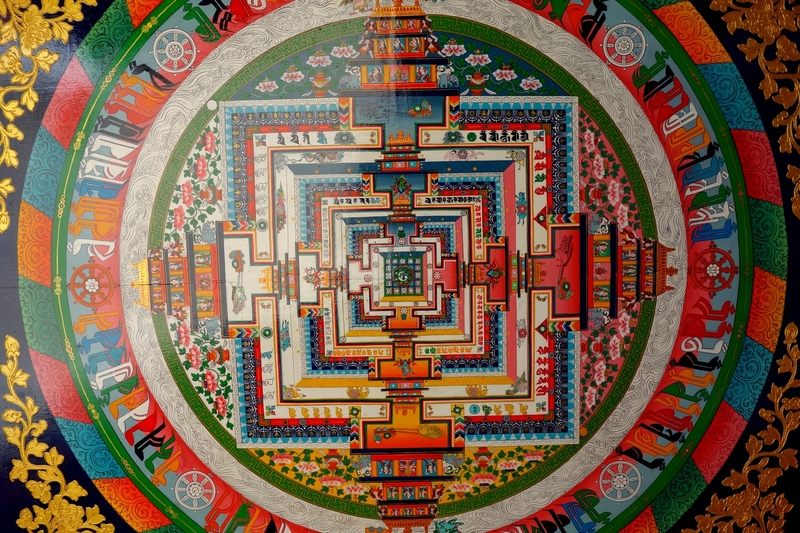 A Khata symbolizes the pure heart and compassion of the giver, and are presented at ceremonial occasions, including births, weddings, funerals, graduations and the arrival or departure of guests. I felt honoured to receive it from these kind people. 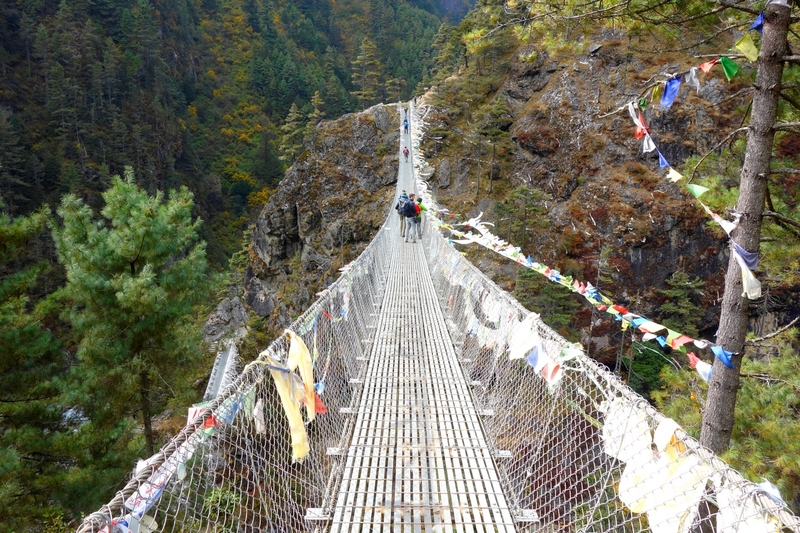 My 100th day in Nepal I spent running again, down from Thame to rejoin the main EBC trekking route. 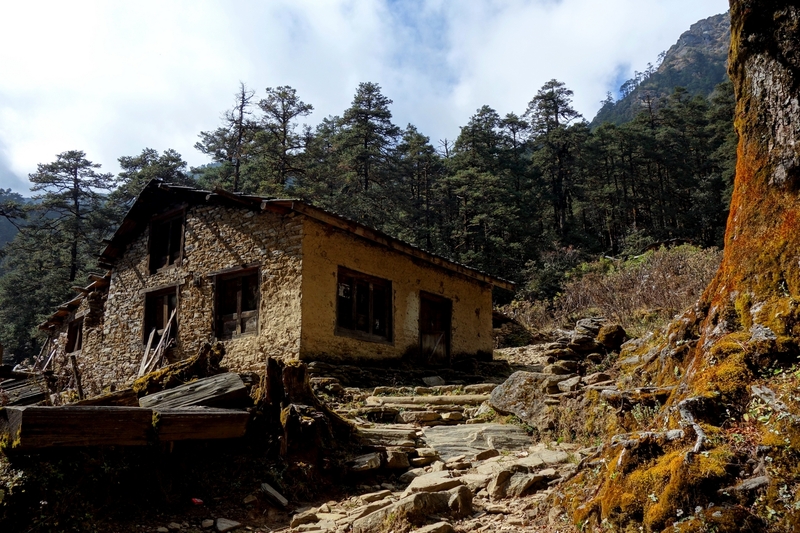 My goal this time was only to reach Phakding, where I was planning to stay in a lodge owned by Dorjee Sherpa who I’d met a few weeks prior in Kathmandu. On the way I crossed paths with a really nice solo Australian girl named Hollie who I’d encountered a couple of times along the trail already. 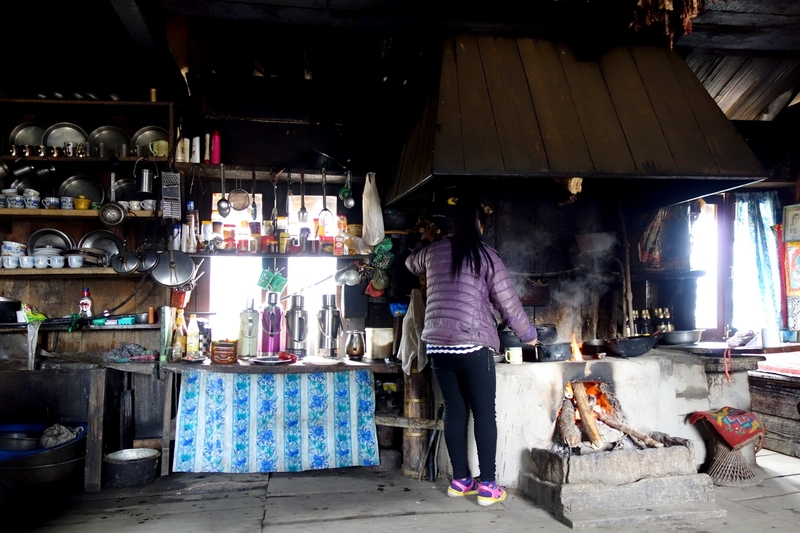 Hollie and I got on well so we decided to join forces for the day and she came with me to the Mountain Resort in Phakding, where we were heartily greeted by Dali, Dorjee’s wife running the lodge. 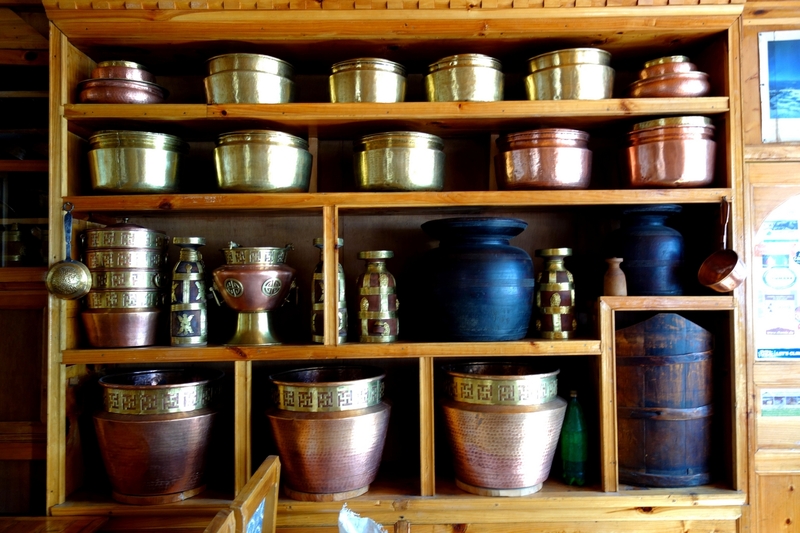 The Mountain Resort had been damaged in the earthquake, but Dali, Dorjee and 17 workers repaired the damage in August in order to get the lodge ready for this trekking season. Hollie and I enjoyed great hospitality, many laughs, and the most luxurious room either of us had ever stayed in in Nepal. 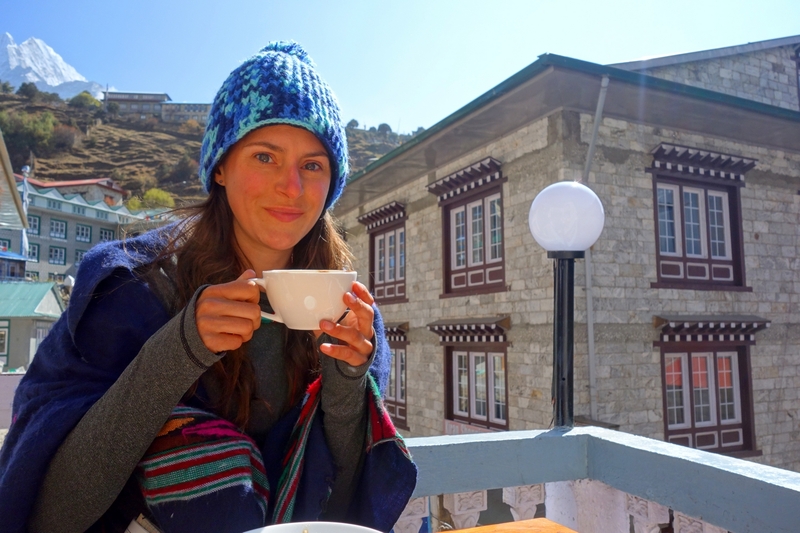 Shortly after Phakding, Hollie and I parted ways, and I passed through Lukla briefly for my last proper coffee before flying into the next section: the Lukla to Jiri hike. A large descent followed by an even larger ascent brought me to the incredibly scenic Kari La pass. I set myself up in the only hotel on this pass and enjoyed wide, sweeping views of the vast valleys surrounding me, with the Himalayas peeking out from behind the hills. From Ringmu I dropped a little elevation before beginning another substantial climb. I traversed a lovely open hillside riddled with edelweiss, which is where I passed the runners from the Everest Trail Race, going the opposite direction. It amused me to see the look of confusion on their faces that I appeared to be a trail runner like them, but running in the wrong direction..!? 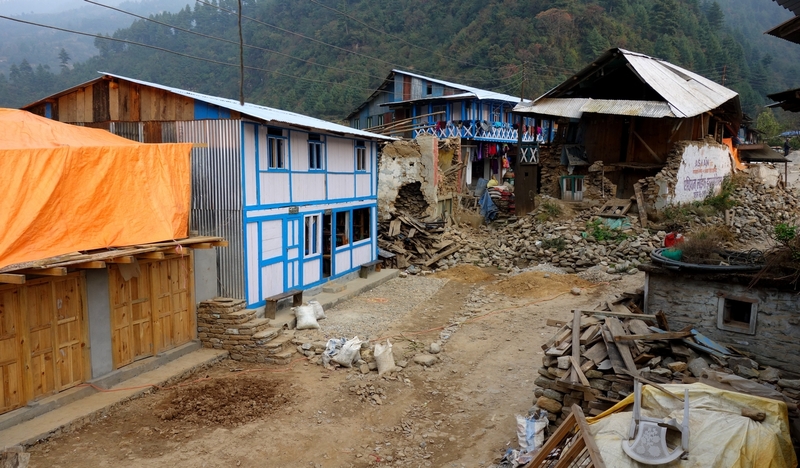 In Junbesi I started too see a lot more damaged buildings from the earthquake; I was entering a region that had been deeply affected. I began yet another grueling many-hour-long climb up into the clouds. The fog added a mysterious and eerie feeling to the route, as I climbed through mossy pine and gnarled rhododendron forests, gripped by the autumn frosts. Though I was extremely happy to reach the top of the pass, my day wasn’t finished, because what goes up must come down, and I had yet to punish my legs with a massive, steep descent. Eventually after 9 hours of running, jumping, climbing 2500m and falling 1400m, I reached the village of Kinja at 5pm. 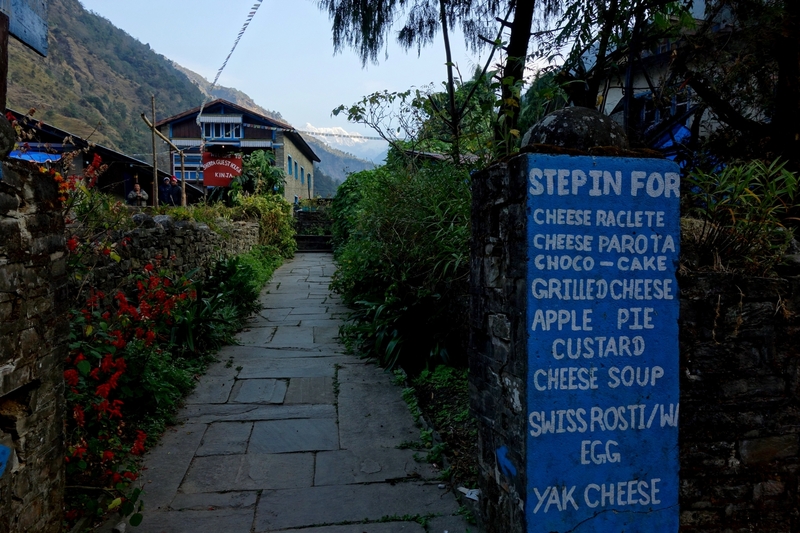 Most hotels in this village were impacted by the earthquake in some way, but I settled on staying in the hotel that promised lots of cheese on their signage. Here, I ate more food than should be physically possible and built playing card houses with the hotel owner’s charming daughter. 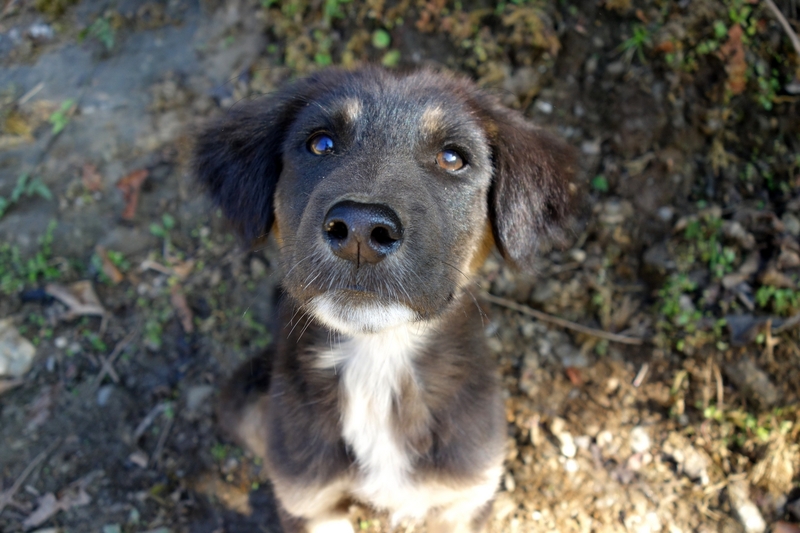 Because who doesn’t love a picture of a puppy? This is a porter I crossed paths with on the way down to Kinja. His load was 80kg, he said (that’s 176 pounds for you Americans). His friend, (in the background) was carrying 100kg. 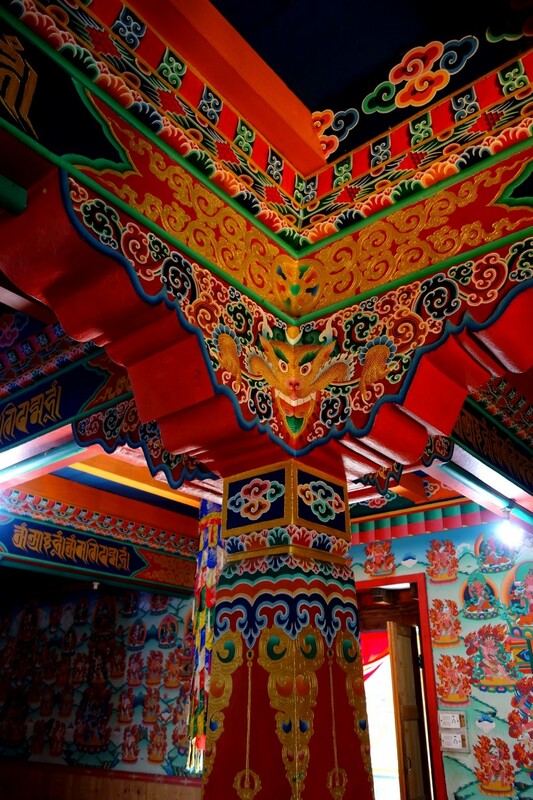 The hotel that called to me in Kinja – you can see why. Surrounded by butterflies, birds, fragrant flowers and lush cardamom crops, I began another ascent shortly after Kinja. At the top of a 600m crest I let myself believe for a moment that I’d reached the top, but alas, I was dismayed to find I still had 875m of climbing left to go. Eventually I did get to the top where, thankfully, there were a few teashops and I was able to get some fried noodles, tea, and apple pie. I’ll be honest that I was feeling pretty DONE with the up-down-up-down nature of the terrain at this point, just wishing I could be finished. I was so close now and had dwelled too much on thoughts of burgers and beer that I stopped enjoying the trail as much. 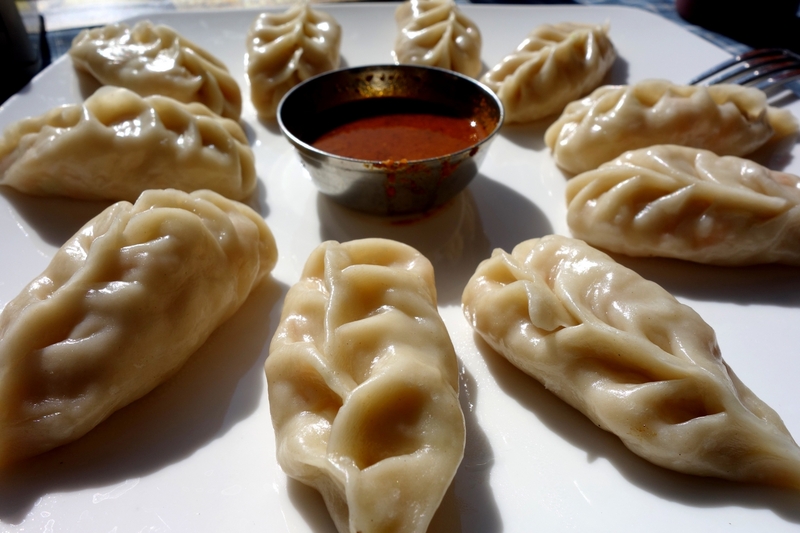 I was a woman on a mission to get a ‘proper’ shower and food, so this day I was planning to hike to Shivalaya where I was told I should be able to catch a bus back to Kathmandu the next morning. However, when I arrived in the village I was told the bus was already sold out! 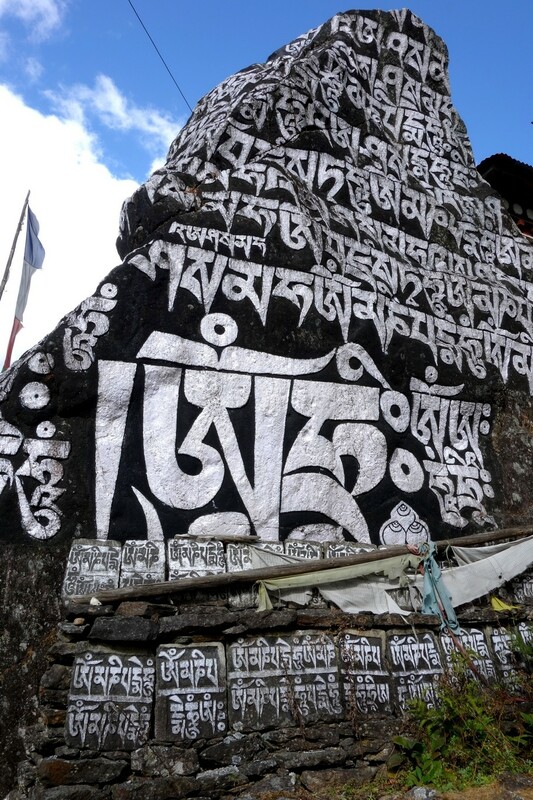 I would have to spend the night in Shivalaya then hike to Jiri the next day and try to get a bus from there instead. 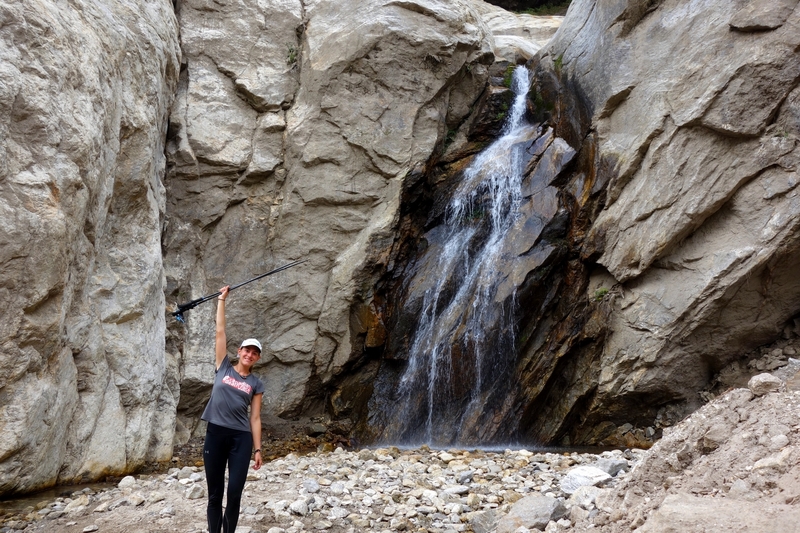 My final (unexpected) day on trail was my 61st day. Since I was mentally finished with hiking already it wasn’t too difficult for me to zone out and power myself into Jiri in just less than three hours. 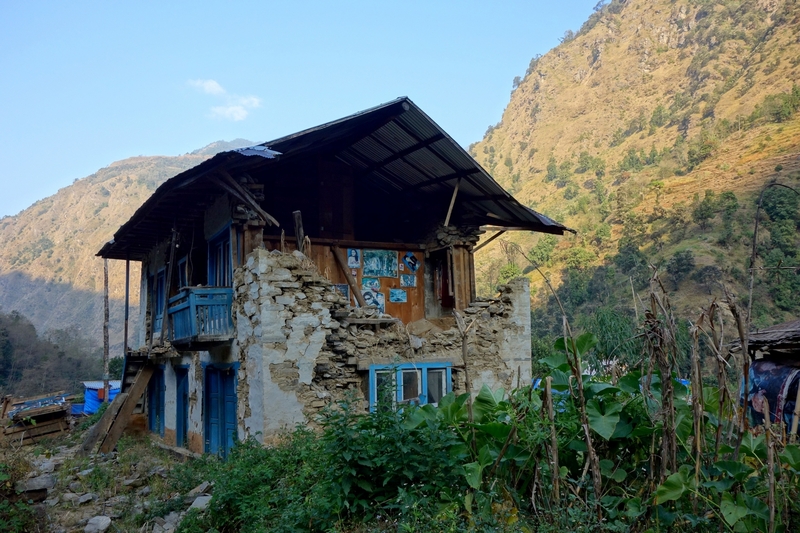 During my hike that day I passed through much earthquake damage in more densely populated areas. I managed to arrive in Jiri by 10am and just happened to get there right in time to catch a bus before it left! Yes! I was happy I wasn’t going to have to spend a night in Jiri. Unfortunately, there were no seats left on the bus. All that remained was standing room, so I stood on this stinky, overcrowded bus for the first 5 hours, then sat on a sack of potatoes for the rest of the way into Kathmandu. As the end of November approaches and winter begins to set in, my time in Nepal comes to a close. With my minimal gear, I’m not prepared to hike in deep snow, so my time on the trail has ended for now. My last days on trail were reflective and bittersweet. In some ways I am happy to be finished, but mostly I am sad to wave goodbye to the beautiful hills and kind people of the mountains and hills. Nepal has gripped my body, mind and soul, and I know this will not be my last trip to this spectacular country. I’m so thankful for my time here. Now, I am in Kathmandu for just a few more days, and next week I can look forward to the next adventure… the Philippines!!! Meshmerizing !!! Enjoyed your natural writings and, of course, photos too. U cannot explain the beauty and joy that one can feel out of the nature. Thank you for your visit to Nepal ! Thank-you for your kind comments! Much appreciated. 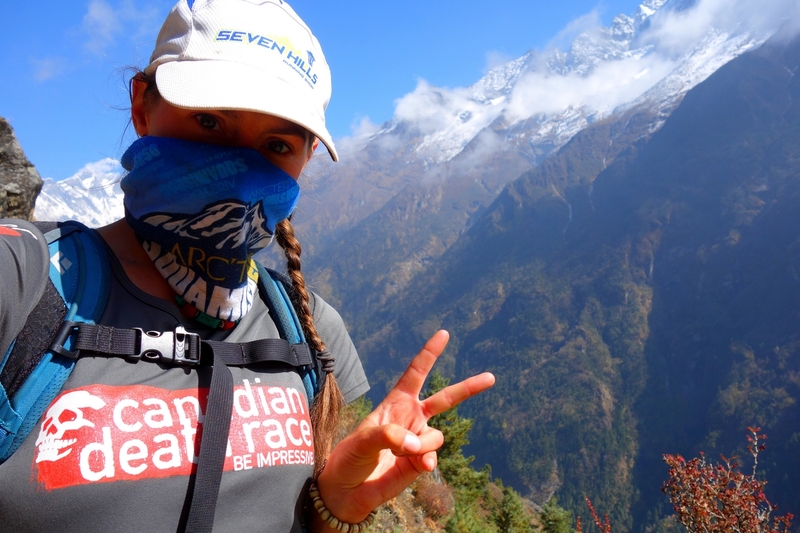 I really really loved my trip to Nepal! You are so right about nature. It must be experienced as it can’t be explained. 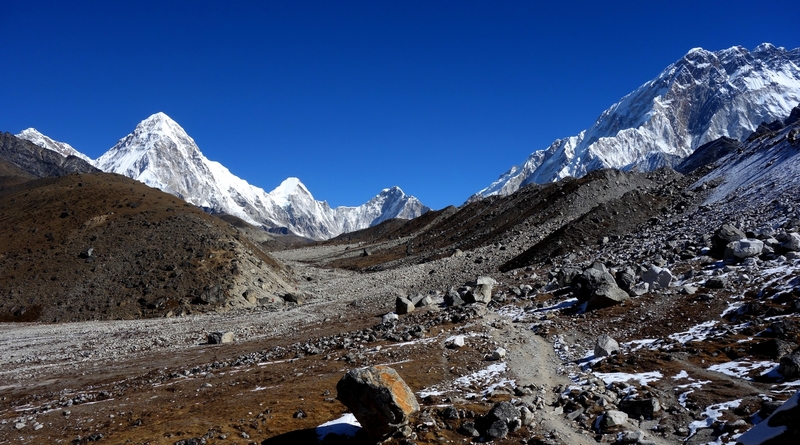 Superb photos of Khumbu Himalayan range and beautiful words about trek Everest Trekking.